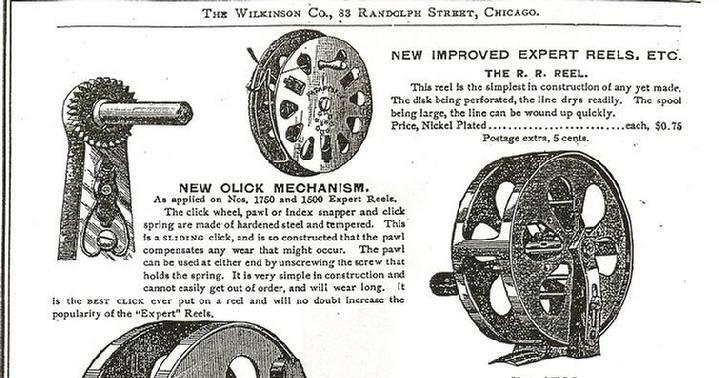 Appearing only in an 1896 catalog from The Wilkinson Company out of Chicago, Illinois, this rare little 2 3/4" diameter reel could easily have been placed in the "unknown" category if it were not for the catalog listing. There are more questions than answers as a result of the minimal information available from the catalog description, and even less from the reels markings. Who or what does "R.R." stand for? While it clearly shows a "Pat Pdg" (patent pending) mark on the back, was this ever submitted to the patent office? I am currently unaware of any patent for this little gem, though I’m hopeful information will turn up somewhere. 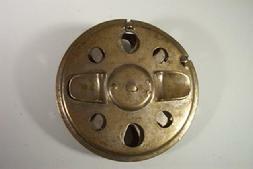 What I do know of the reel is what’s written in the catalog description, that it is indeed "simple in construction", made of nickel plated brass (the example I have, the only one I’m aware of, has lost most of it’s original nickel finish) with a steel center screw. The perforations are the result of a combination of tear dropped shaped holes, and stamped and folded down sections that make up the arbor. 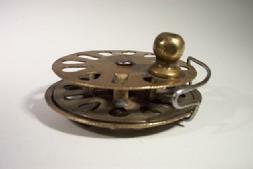 The reel foot is stamped out of the bottom section, and a simple fixed click is placed below the spool. The removable line guide is a simple brass section bent to the shape of the spool. It must not have been a great seller, perhaps due to the popularity of the Meisselbach reels that were listed on the same page of that 1896 catalog. I thank Washington state ORCA member Tom Harwood for allowing me to add it to the collection! 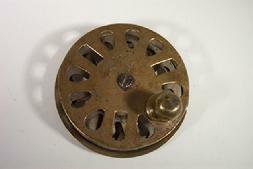 If you have any information on this reel, please drop me a line.